Mobility is the trend nowadays, and everything is becoming portable. There are the likes of portable software which we can access and use even without installation, portable laptop which we can carry around everywhere we go, portable players of MP3, CD, DVD and so much more. In this world of convenience, we can also manage to have portable kitchens which are suitable for those who are constantly on the move. In this article, we will learn about five unique designs of a mobile kitchen that you can do yourself. The Compact Kitchen Why this is called as such is because this portable kitchen is a dining area and a storage area plus kitchen in one. This is especially helpful to people living in a small unit of condo or apartment with limited space. The compact kitchen involves a square or rectangular area where a kitchen counter can be transformed into a dining table and they can be folded back when necessary to store cutlery. This design is most appropriate for bachelors and single people who do not have a lot of guests coming to their homes to party. This type of kitchen is easy to set up and to serve food for quick, sit-down meals and buffet-style meals. The Innovative Kitchen Composed of all innovative things, this portable kitchen consists of a foldable table where the handy electric stove can be placed, a warming plate, and dishwasher. Below it can be a mini fridge with a microwave on top. Saving space, this fully-functional kitchen can offer you enough room for cooking and storing kitchen utensils. You can even add counter tops that can be opened and closed with the use of a remote control. With the sink attached to the stove, you can make the cleaning process hassle-free. Racks There’s a popular steak restaurant called “Racks,” but this is not the same with the one you can make in your home. “Racks” is what you can name your portable kitchen if you plan to create it using removable racks that can pose as shelves on your wall (instead of cabinets that take up a lot of space). This is where you can hang all the utensils and display the plates. You can also leave the racks plainly standing there to serve as interior design. This is a smart design for people who do not know how to keep their kitchen organized. The Cart Kitchen We have all grown familiar with food carts in the streets. Why not copy the idea and boast it among your friends? By having a portable cart that houses a burner, small electric stove and simple kitchen materials, you can already cook favorite meals and express your culinary skills without any much hindrance. This will not be conventional kitchen, but this cart kitchen style can nonetheless accommodate your needs. 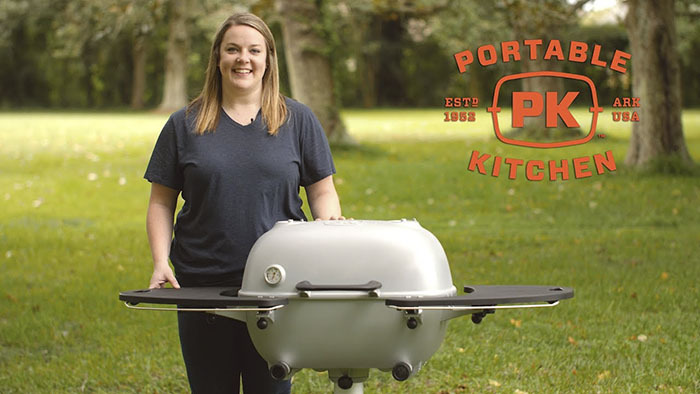 Because you can move around the electric appliances for cooking and the cart has wheels, you can even take the cart kitchen to any outdoor space and spend time with your family while pretending you’re on a vacation out of town like camping in your own garden. You can also bring the cart kitchen to your garage area and grill meat and create delicious barbecue there. Use the recycle bins and composting bins for seating. Kitchen in the Car Who says kitchens should only be placed in a house? When it comes to designing your portable kitchen, there are no rules to live by. If you are a traveler, you can create a mobile kitchen in your car. This can be made possible if you have a truck or SUV that has ample space to carry the structure. What you will need are hardy and stable items and storage for food items. The walls of the vehicle can serve multiple purposes such as shelves of the pantry or trays. Notes All these ideas are primarily dictated by the minimal space you have. You also have to take note and plan according to your budget and layout of your house and car. Think good ergonomics and prepare a detailed list of all the things you will need to create this moveable kitchen. Choose to use light and mobile pieces of equipment and say no to bulky ones (even if they are made of heavy-duty materials). Moreover, it is wise to measure your floor plan and the size of every item you will place in the portable kitchen. To guide in the decision-making process, think of yourself as a military person who will need to get things fast with simple and accessible items all around. Know where the windows and doors are, as smoke will get in the way when you cook food using the stove. There should be enough ventilation and exhaustion else somebody might think there’s fire burning in your home. If you do not have the skills to layout or build your kitchen yourself employ the services of a food truck kitchen builder to design the kitchen, incorporating all building and health department rules that apply. Things to Bring You’re not going out to camp but you should always have these things for your portable kitchen to be complete: pots in different sizes, skillets, plates and bowls, utensils, travel pouches, cups, knives and cutting board, barbecue lighter, griller, matches and lighter, Ziploc bags, paper towels or rolls of tissue paper or wet wipes, spatula, whisk, serving spoons and stirring spoons with long handles, can opener, hand sanitizer, sponge for cleaning dishes, liquid soap, Tupperware for leftovers, water bottles, different spices, bottle of cooking oil, tin foil, food recipes (just in case you need inspiration), garbage bags, French press to make excellent coffee, propane to fuel your stove, and stove. One of the most pivotal parts in our homes is the kitchen. It is where food, drinks and family conversations are held at the end of the tiring day. From breakfast, lunch to dinner, we spend about three hours per day preparing food that nourish our souls and satisfy our loved ones. With knowledge in space management and ability to create a moveable kitchen inspired by these designs, you can have so many options for a DIY portable kitchen. Mobile kitchens are ideal customized solutions that serve real function. What you get best in return as a benefit is mobility that is tailor-fitted to your lifestyle. If you are not sure how to do it, you can hire professionals to create this temporary on-site kitchen not only in houses but in fairs, concerts, festivals and other public events and parties. The experts from the Sarasota Tree Nursery canbuild your dream landscape. You can have a beautiful home with new sod installation, tropical palm trees, potted plantings, and other Landscaping Sarasota FL features.